Two months ago, on the eve of Ney Franco’s dismissal from São Paulo, I floated the theory that Muricy Ramalho would soon return to the club after four years away. And I wasn’t the only one. It soon emerged that a return for Muricy would be too costly for the São Paulo board at that moment and another former coach, Paulo Autuori, was called in to fill the vacancy instead. Three wins in 17 matches later, Autuori was sacked and with desperation kicking in, Muricy was brought back. With São Paulo entrenched in a relegation fight, Muricy has nothing to lose upon returning to the Morumbi. If he manages to steer them to safety, he will be the hero; if they eventually suffer relegation, he will argue that the damage was done before his arrival. The 1-0 win in his first match in charge, at home to Ponte Preta, proves very little. Ponte Preta did not pose much of a threat to São Paulo, and footballers often give above-average performances under a new coach in an attempt to impress and consolidate their place in the team. São Paulo has a difficult month of fixtures ahead and once the “Muricy novelty” wears off, it will be interesting to see where they stand come October. São Paulo has long been recognised as having one of the best squads in Brazil, an invention with which I struggle to agree. They do have some supremely talented players, like Luis Fabiano and Ganso, and several with great work-rate and fitness, but few are well-rounded or complete. In fact, I regard Jadson as being the only complete player in São Paulo’s squad, someone who has talent, technique, ability and creativity. Besides Jadson, the São Paulo squad is bursting with creative players who can’t mark, quick wingers with no creativity and hard-workers with no ability. Even more worrying is that Jadson’s role in the squad is being marginalised and he is played out of position (or left on the bench) in order to make space for Paulo Henrique Ganso. Ney Franco and Paulo Autuori struggled with the Ganso question and their inability to find a suitable solution ultimately contributed to their downfall. When the club’s backroom staff brought the playmaker to the Morumbi for R$ 24 million in 2012, São Paulo already had Jadson playing in Ganso’s position and on magnificent form. Due to the exceptional amount of money spent on the transfer, there was huge pressure placed on the head coach to select him and get him playing well. However, one year into his São Paulo career, Ganso has yet to look comfortable in the tricolor shirt. Not long before he was given his marching orders, Paulo Autuori uncovered a potential solution to the Ganso question. Two weeks ago, with Luis Fabiano suspended for an away match against Botafogo, Autuori set up São Paulo in a 4-2-3-1 shape with Ganso as a false nine. 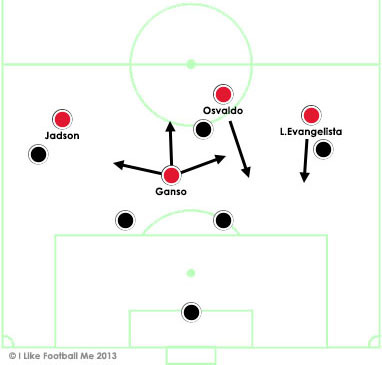 With Jadson and Lucas Evangelista marking the opposition full-backs and Osvaldo making bursting runs from attacking midfield, Ganso was allowed the freedom to focus on his own game, staying in advanced positions and organising São Paulo’s attacking moves. The match finished 0-0, but it was one of São Paulo’s most convincing performances of the season and they successfully neutralised an excellent Botafogo team. Unfortunately, this was the one and only time São Paulo has played that way, as Luis Fabiano returned from suspension for the following match and went back to his role as centre-forward. Luis Fabiano is a poacher who, like Ganso, contributes nothing to defensive phases. When they play together, the rest of the team is left with much more work to do and they are easily overrun in midfield. That is not to say that they cannot play together, but when a team plays with these talented “luxury” players, these players need to make up for their lack of defensive work by scoring goals or providing assists. Brazil is full of good examples of this type of attacker, such as D’Alessandro at Internacional, Douglas at Corinthians, Valdivia at Palmeiras and Alex at Coritiba. Neither of them make much of a contribution to their team’s defensive play, but all of them consistently create goals. Paulo Autuori’s last match in charge, a 2-0 away defeat to Coritiba, highlighted this perfectly. On one side there was Luis Fabiano and Ganso; on the other, Alex. Luis Fabiano and Ganso were easily marked and made next to no impact on the match. Alex organised his entire team, created several chances and scored both of Coritiba’s goals. He didn’t mark, he didn’t need to. Against Ponte Preta on Thursday evening, Ganso played a good through ball for Luis Fabiano to score the only goal of the match, justifying their selection. The Brasileirão is back after the month-long pause for the Confederations Cup. Plenty has changed since then: managers have been sacked, players have been signed and others sold. It’s almost as if we are back to week one. This weekend’s headline games are on Sunday with two clássicos due to take place, but there is still plenty of interest in this evening’s four fixtures. Renato Gaúcho will coach his first match at Grêmio since returning to the club earlier this week. Their first opponents are recently promoted Atlético-PR, whose quick and direct style will certainly cause Grêmio problems. Renato is unlikely to impose any drastic strategy changes early on and Grêmio should line up similarly to how they did under former coach Vanderlei Luxemburgo. Renato’s primary objective is to restore confidence in the players, who have been struggling since their Copa Libertadores exit in May. With the sale of Fernando to Shakhtar Donetsk for €11 million, Grêmio have lost an important presence in midfield. Fernando is an intelligent and strong defensive midfielder, able to defend and attack. His replacement, Adriano, is more of an auxiliary centre-back. He marks well, but does little else. Flamengo will face Coritiba in the Mané Garrincha in Brasília, some 1,400 km from their home city of Rio de Janeiro. With the ongoing licitation process for the new Maracanã and the closure of the Engenhão for repairs, Flamengo have not played a match in the city of Rio de Janeiro since 6th April. Although Flamengo do have a big support in Brasília (the match is expected to sell out), this situation cannot go on. With the constant travelling, the playing squad are starting to get upset, with goalkeeper Felipe commenting on social media that perhaps he “should move to Brasília, seeing as that’s where Flamengo play now”. Since Mano Menezes has taken control at Flamengo, they are a more compact and organised side. Today’s match may not be a classic, but if Flamengo can get back to Rio soon they could have a very respectable year. In Brazil’s northeast, Náutico – Ponte Preta marks another coach’s debut, that of Ponte’s new man Paulo César Carpegiani. Former manager of the Paraguayan national team and World Champion with Flamengo in 1981, Carpegiani is one of my favourite coaches in Brazil. While many of his peers are set in their ways and repeat the same mistakes over and over, Carpegiani is always looking to innovate and improve his methods. For example, he was one of the first Brazilian coaches to choose to watch the match from the stands, where he has a better view of the field of play. Such practice is unheard of in Brazil, and usually frowned upon by supporters, who prefer their coach to be waving his arms and screaming on the touchline. Tonight’s late game is between Portuguesa and Cruzeiro at the Canindé in São Paulo. Out of Brazil’s traditional big clubs, Cruzeiro is the one that has improved most during the current transfer window. Diego Souza, Dedé, Nilton, Everton Ribeiro and Dagoberto are all premium Série A quality players. The team is playing well and looking organised under Marcelo Oliveira. They are suffering from injuries today however, and will hope to avoid dropping points away to Lusa.